HÀ NỘI — The National Centre for Hydro-Meteorological Forecasting has warned northern mountainous provinces of the imminent threat of flash floods and landslides. According to the weather service, in the early hours of Tuesday morning, parts of Điện Biên, Sơn La and Lai Châu suffered medium to heavy downpours, with rainfall reaching 31-43mm. Torrential rains are forecast for the region overnight, and are likely to trigger landslides in the districts of Mường Chà, Mường Nhé (Điện Biên), Mường Tè, Phong Thổ (Lai Châu) and Yên Châu and Thuận Châu (Sơn La). Hà Nội is also forecast to experience heavy rains combined with thunderstorms high winds today and Thursday. 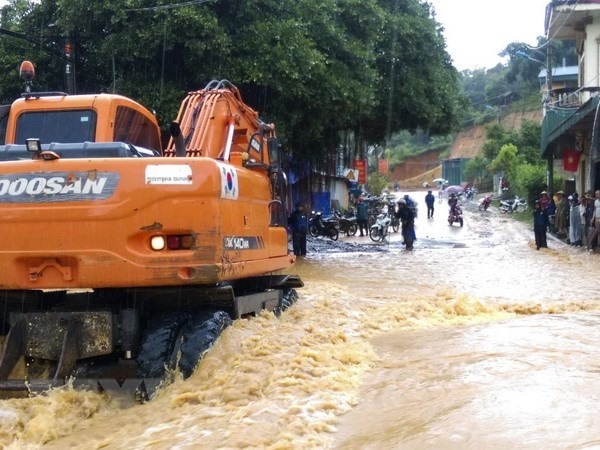 Landslides triggered by heavy downpour in the northern province of Điện Biên since Monday night have disrupted traffic on a number of routes. Lương Thanh Tùng, director of Land Road Company II, said landslides occurred at a number of sections on the National Highway 4H, with more than 3,000cu.m of rock and soil falling down onto the roads. The company has deployed workers and machines to clear the damaged route, but continuous torrential rains were hampering the repair work, he said. The roads should be open to traffic again by Tuesday evening, Tùng said. Initial statistics from Tủa Chùa District’s People’s Committee showed Mường Báng, Xá Nhè, Sinh Phình and Mường Đun had suffered most with a number of traffic and irrigation structures being affected. Traffic damage was estimated at more than VNĐ2 billion (US$86,000). Water levels in Tông Lệnh Reservoir have reached an alarming level while the Tân Phong Irrigation Project at the section crossing Nậm Seo Stream is also on the verge of collapse. Tủa Chùa District has recorded dozens of hectares of rice fields and fish ponds in Sinh Phình, Mường Báng and Xá Nhè communes that have been flooded. Phạm Quốc Đạt, chief of the district’s People’s Committee, said local authorities had been instructed to direct the recovery work so that life could return to normal soon. Similar damage was also reported in Nậm Pồ District, as one bridge and 150m of road leading to the district’s centre were destroyed by the floods. “These are historic floods,” said Khoàng Văn Van, head of Chà Nưa Commune’s Party Secretary. As of Tuesday evening, no human casualties had been recorded in the province but floods had inundated 130ha of rice, 30ha of and fish farming areas, swept away 100 cattle and fowls. As many as 69 houses were totally ruined and some villages were isolated as incoming and outgoing traffic became nearly impossible. Schools, People’s Committee buildings, post offices and houses had all been affected by heavy rain, he said.